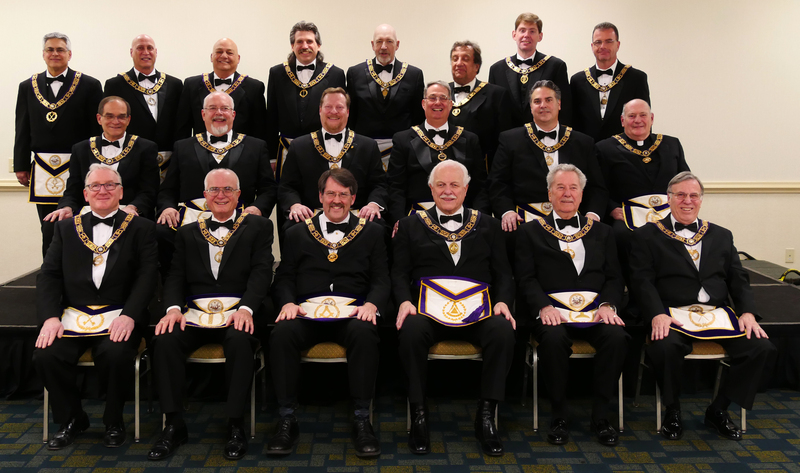 2016 Grand Lodge Officers – The Grand Lodge of Connecticut A.F. & A.M.
Newton Buckner, III (RW Grand Treasurer, Melvin E. Johnson (RW Grand Junior Warden), Theodore J. Nelson (RW Deputy Grand Master), Gail N. Smith (MW Grand Master), Marshall K. Robinson (RW Grand Senior Warden), Richard C. Memmott, Sr (RW Grand Secretary). Francis S. DiStefano (RW Grand Senior Steward), Bruce R. Bellmore (RW Grand Marshal), Stephen W. Petri (RW Grand Senior Deacon), William E. Bohman (RW Grand Junior Deacon), Joseph J. Porco (RW Grand Junior Steward), Rev. Joseph R. Krusienski (RW Grand Chaplain). Brian E. Beals (Deputy Grand Treasurer), Frank R. Mangiero (RW Associate Grand Tiler), Joseph F. Massa (RW Associate Grand Tiler), Richard C. Memmott, Jr (RW Grand Tiler), Charles W. Yohe (Director of Communication), Gary A. Littlefield (RW Grand Historian), Rev. Carl H. Anderson (RW Grand Organist), Shane Dufesne (Grand Almoner).